Flash Flooding Happening Now; When Does it Stop? The Piedmont will deal with flooding rain through early tomorrow morning. 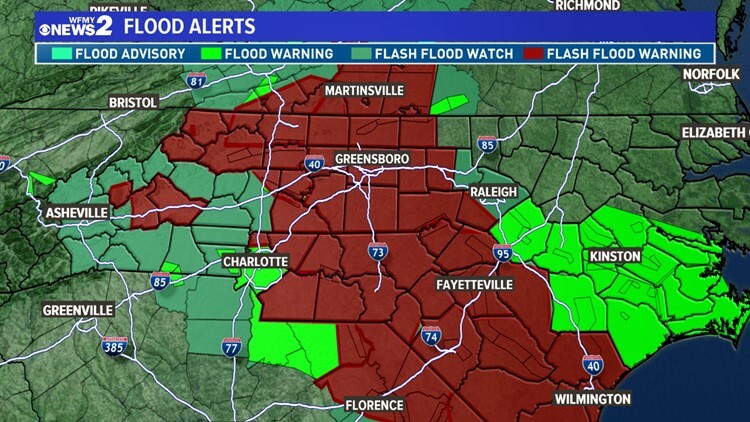 GREENSBORO, N.C. -- Flood warnings stretch across North Carolina from the coast to the mountains due to Florence. WHERE IS THE HIGHEST FLOOD THREAT? The threat will be highest across the southern Piedmont and the Foothills where rain totals could exceed 10" in areas. Elsewhere, rain totals will end up in the 5-10" range. 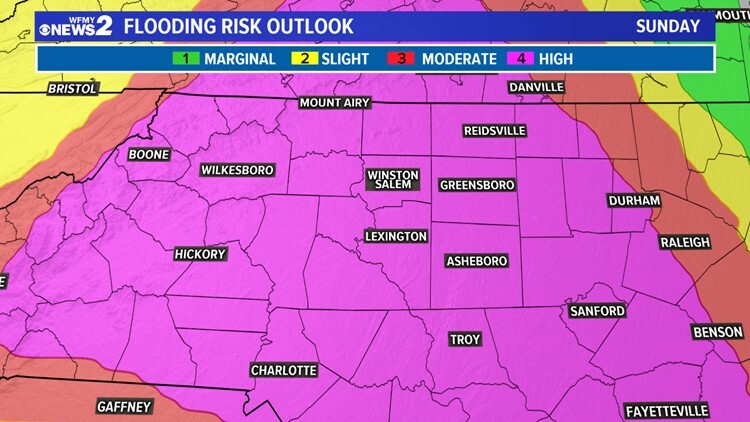 The Weather Prediction Center has most of our viewing area in a "High Risk" of flash flooding. Rain: The rain will continue to fall in buckets through early Monday morning before exiting the area during the day on Monday and Monday night. Flooding: Flooding will be severe in some areas. Especially the southern Piedmont and the Foothills. Power Outages: Some power outages are possible, but they shouldn't be widespread. Tornado: Isolated tornado or two is possible, through Monday morning. SHOULD I BE WORRIED? WHAT SHOULD I DO? By now you've probably already prepared for power outages. That's a big step. Make sure you know your flooding risk. If you're in an area that floods easily or has flooded at some time in recent memory, you're at risk of flooding this time too. Widespread evacuations aren't needed for our area, but if you have concerns about flooding in your neighborhood you might want to ride out the storm at a friend or family members house. Shelters are also available. WHEN WILL THE RAIN END? A few showers and a few storms will stick around through Monday evening. By Tuesday, the weather will be mainly dry, but an isolated shower and storm can't be ruled out Tuesday afternoon. The rest of the week should remain dry. The News 2 Weather Team will keep you up to date and in the know and be with you every step of the way.